Sand anchor winch can be also called river anchor winch, land anchor winch, ground anchor winch, is one of the functional anchoring tool for many places, such as the boats, deck, cabin, shore, beach and shipyard. Used the most advanced technology and production equipment, just like the land anchor winch test platform, 3m gear hobbing machine, C5225 double column vertical CNC lathe, the big shot blasting machine and so on. Ellsen- the professional river anchor winch manufacturer will offer you many kinds of high quality sand anchor winch for sale. First, from the power supply, Ellsen can mainly offer you four types winch sand anchor for sale. The first, of course is the electric anchor winch for sale, which driven by motor that run though electricity. the second model is the hydraulic sand anchor winch for sale, this kinds of winch sand anchor also can be called electric hydraulic ground anchor winch, which relied on motor to drive oil pump, then though the speed reducer to run the transmission gear, and then leading to the rotary winch ground anchor for sale. During our many years’ hard working, we can design and produce the automatic hydraulic winch for sale, in which we equipped with the chain length sensor, under the condition that all the wheel chain on a winch land anchor are thrown, the sand anchor winch will stop working. As well as the land anchor winch will also reduce its speed automatic when the anchor near to hawse pipe. This advanced and humanized design on a river anchor winch not only can help the owners of boats and vessel raises their working efficiency, but also can ensure the highest safety. Finally, the last two types of ground anchor winch are the steam and manual ground anchor winches for small boats for sale. 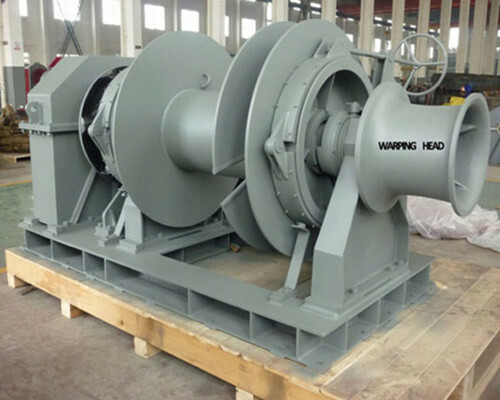 Depended on rich experience and advanced technology, we will free design and produce the manual or steam sand anchor winch for our customers if needed. The most important point in Ellsen is that we also offer our customers the unique customized service, not only in the aspect of pulling capacity, rated load, rope diameters, electro motor type, the orm dimension, but also in the weight, appearance, color, logo and remote control. Commonly, our winch ground anchor’s rated load is from the 10 ton to 650 ton in two different speeds, they are the slow speed and the high speed. The rated speed is from the 8m/min to 10.5m/min. and the rope capacity is from 170m to 3600m under the 22 to 160 KW. Welcome to Ellsen to custom your dreamy winch sand anchor winch for sale. Fast and free to response your inquiry, in which with price and products catalogue, as well as our free suggestion for your river marine anchor winch projects. Free design and plan your land anchor winch project though out strong anchor winch technology teams, not only just the ground anchor winch chart, but the CAD drawand 3D simulating rending if needed. Anytime to visit each of our 6 anchor winch factories. High quality and low price that is fifth lower than the other sand anchor winch manufacturers. Fast and cheap delivery suggestion from our experienced sales managers.